Robotics is invading our homes little by little, and not only because the machines want to help us carry out domestic tasks or because their metallic arms make some of our furniture. Automatons are also coming to the construction sector, which little by little incorporates technological innovations already present in other areas. There are several companies that are promoting that robots act as bricklayers to accelerate the pace of work or increase the safety and capabilities of human workers in the future. Lay 1,000 bricks in one hour? 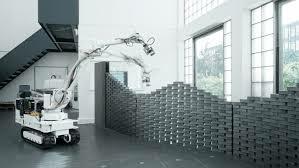 Today, there are numerous projects that claim that robots are capable of erecting buildings. 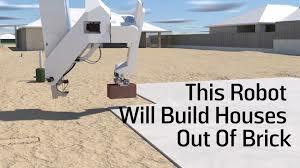 The Australian company Fastbrick Robotic, for example, has been developing a model of a truck equipped with a robotic arm that will be able to lift the master walls of a house in less than two days: it places up to 1,000 bricks in a single hour. This vehicle-robot, baptized as Hadrian X, will be launched on the market in 2019. Now, it will only be available to large construction companies: its price will be around 2 million dollars (almost 1.7 million euros). Although logically Hadrian X can carry out the work of several bricklayers, the company emphasizes in its website that its system promotes a future of construction in which humans and machines will collaborate, thus avoiding the current controversy over whether robots will take away our work. in the future. Likewise, other companies are developing systems in which automata lend a helping hand to humans. This is the case of Blueprint Robotics, a US company in which both automata and workers join forces in a modular assembly line. The machines are mainly responsible for manufacturing the parts of the house, which are then transported to the place of construction to be assembled by humans. Thanks to this method, this company increases the speed of construction of a house and lowers its overall cost. 3D printing is another technology that has broken into the construction sector in recent times by automating the building survey. A few months ago we knew the BigDelta, a giant 3D printer capable of building a house in a week. Recently, the prestigious Massachusetts Institute of Technology (MIT), had a huge robotic arm capable of 3D printing the basic structure of a dome more than 3 meters high and 15 meters in diameter. A feat that achieved in less than 14 hours thanks to the spray a type of foam that fits the desired shape. The objective of these robots is not to create family homes in the form of igloo, but to send them into space to print structures in inhospitable places like Mars more economically, since they use light construction materials. Meanwhile, another company intends to build small and sustainable houses thanks to 3D printing. The Ukrainian startup 'PassivDom' has managed in just 8 hours to manufacture the walls, the floor and the roof of a house that has solar panels. In this case, it is also a system that requires human intervention to complete the construction, since there is a need for workers to place the windows, doors and pipes of these prefabricated houses. Beyond replacing humans in the building site, which certainly can be a cause for concern among building workers, the fact is that robotics can also help make your work more comfortable. In fact, there are those who are already developing exoskeletons that are integrated with the human anatomy to make these professionals not suffer so much physical wear, helping to prevent injuries. For example, Ekso Bionics, a company based in California, has developed an exoskeleton model for construction and factory workers, with a load capacity of between 2 and 7 kilograms per arm. For its part, the European project Robo-Mate is developing a kind of extensor arms that increase the strength of workers, making the effort to lift a load 10 times lower. The market for exoskeletons is taking off: according to the forecasts of ABI Research, it will move 1,900 million dollars (almost 1,600 million euros) in 2025. If these predictions are fulfilled, and even taking into account that they will have different uses and publics, it may be that the exoskeletons share a box office next to the regulation helmet in the works of tomorrow. However, its high price will hinder its adoption in all construction companies at first. So while the debate about the risks of automatons replacing us in the work continues open, the construction sector has joined the transition promoting hand-to-hand work between robots and people.